Lathrop, CA.– Thousands of fans flocked the shores of Mossdale Quarry Lakes to watch the world’s top wakeboarders battle it out during the final day of the MasterCraft Pro Wakeboard Tour presented by Rockstar in Lathrop. Claiming gold in the Golden State were Phil Soven in the Men’s Pro division, Amber Wing in the Women’s Pro and Tony Iacconi in the Overton’s Junior Pro Series. Soven laid down near flawless aerials and technical rail maneuvers to boost his way to first place in the six man finals heat. Joining Soven on the podium were Austin Hair and Dean Smith who both put in excellent final round performances. Wing, who squeaked out a narrow victory over local rider Melissa Marquardt, displayed stylish riding throughout the entire event to earn top honors. Dallas Friday also displayed stellar riding to claim the final podium spot. The Overton’s Junior Pro Series riders showed the future of the sport is in good hands. Leaning on a dominating final round performance, Tony Iacconi took the division’s top spot over Cory Teunissen and Gordon Harrison. Following the final rounds of action, fans enjoyed the Polaroid Action Big-Air Contest. The event featured top athletes performing exciting and innovative tricks that aren’t typically attempted in a traditional contest setting. Riding behind the MasterCraft X-Star, Dean Smith won the specialty event busting a huge backside 720. For information on the MasterCraft Pro Wakeboard Tour presented by Rockstar Energy Drink, visit http://www.kingofwake.com. MasterCraft is the exclusive towboat for the Pro Wakeboard Tour, as it has been since the tour’s wakeboarding events began in 1992. The King of Wake is the world’s elite pro wakeboarding series, attracting the sport’s top athletes from throughout the globe. Over the course of a season, athletes compete for the ultimate wakeboarding crown in a series points race of eight events throughout the United States to see who rules the wake. The 2013 series consists of all five stops on the MasterCraft Pro Wakeboard Tour, the Nautique Wake Games, the Nautique WWA National Championships and the Rockstar WWA World Championships Presented by Supra. The King of Wake is organized by World Sports & Marketing – the leading wake-events producer since 1988. Rockstar Energy Drink is designed for those who lead active lifestyles – from Athletes to Rockstars. Available in over 20 flavors at convenience and grocery outlets in over 30 countries, Rockstar supports the Rockstar lifestyle across the globe through Action Sports, Motor Sports, and Live Music. New from Rockstar for 2013, Rockstar Energy Water is a non-carbonated and sugar free enhanced water beverage that is now available throughout the U.S. in three refreshing flavors. 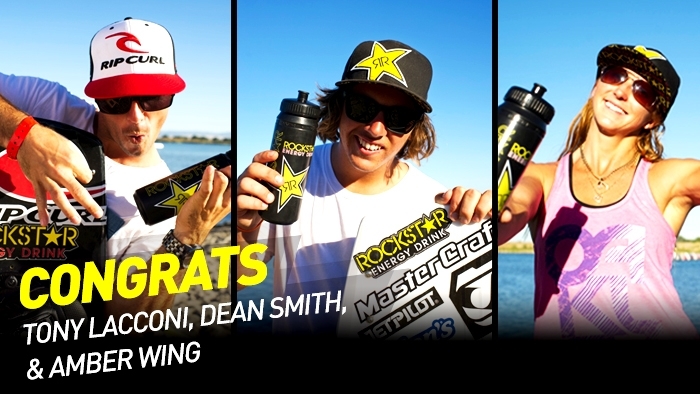 For more information visit: http://www.RockstarEnergy.com. In recent years, Polaroid has expanded its range of products in consumer electronics and photography, such as instant and digital cameras, high-definition camcorders, mobile printers, tablets, flat-screen TVs and more. People can expect to see newPolaroid products that will deliver the fun, instant gratification and value that the brand has long stood. For more information, visit http://www.polaroid.com or http://www.polaroidstore.com.